The traditional approach to Google Adwords is to set a bid price for each keyword. This is known as Cost Per Click (CPC). Google then then uses the bid prices in conjunction with a secret formula (the quality score) to decide how high to rank your ad in the Adwords results. If you bid more, your ad will appear higher and typically get more clicks, but your cost per click will increase. So setting an optimal bid price is important. Bid too little and you won’t rank high enough to get a decent number of clickthroughs. Bid too much and you will potentially end paying more to Google than you recoup in sales. An alternative approach is to tell Google Adwords how much you are prepared to pay for a particular action, e.g. a sign-up, download or sale. This is known as Cost Per Action (CPA) or Conversion Optimizer. Google will then automatically calculate your bid prices and attempt not to exceed the CPA you set (although this isn’t guaranteed). CPA sounds great. I can stay in bed a bit longer while the mighty Google brain does the bid tweaking for me. Unfortunately I wasn’t able to use CPA. I count sales as conversions (not downloads) and I have my adwords account split into a number of campaigns by geographic region and by type (e.g. search vs content). Having my campaigns structured like this, rather than one monolithic campaign, makes for more flexibility (e.g. different ads, phrases and bid prices for different geographical areas) and more useful reports (e.g. separate reports for search and content). But it also meant none of my Adwords campaigns made the minimum threshold for conversions per month. When Google dropped the minimum threshold for CPA to 30 conversions per campaign per month, one of my Perfect Table Plan search campaigns became eligible. So I did an experiment. I ran a campaign for 4 weeks using CPC, then 9 weeks using CPA, then another 4 weeks using CPC. I set the CPA bid to roughly the average cost per conversion I got for CPC. I was curious to see if Google would find sweet spots that I had been missing or whether they would bid as high as they could to take as much money off me as possible. Summary: CPC outperformed CPA on all key metrics, including: 4.4% higher conversions, 9.4% lower cost per conversions and 8.0% higher profit. The values given are taken by computing (CPC metric – CPA metric)/(CPA metric). E.g. ROI of +10.4% means that CPC had a 10.4% higher ROI than CPA. Only a single (geographically based) search campaign was measured. The total number of conversions during the time period of the test was in 3 figures. I only measured sale conversions. This gives me less data than measuring downloads, but I think it is unsafe to assume the number of downloads correlates closely to the number of sales. The PerfectTablePlan sale price is £19.95/$29.95. To calculate profit I only counted 75% of the price of a sale (the other 25% was assumed to cover the cost of support, ecommerce fees and other overheads associated with the sale). Each of the time periods was a multiple of 7 days to avoid any issues with different results on different days of the week. I ran CPC for an equal amount of time either side of the CPA test to try to balance out any seasonal factors. PKI is Profit Per Thousand Impressions. ROI is Return On Investment. A CPA campaign running for 9 weeks wasn’t able to outperform a mature CPC campaign. The CPC campaign had been running for over 4 years, but one would have thought CPA would have been able to use that pre-existing data. CPA might have performed better if given longer. It would probably also have done better against a less mature CPC campaign. Google didn’t rob me blind using CPA bidding. The CPA cost per day was only 5.5% higher. The results weren’t hugely different. On the basis of the above results one might still conclude that CPA is superior to CPC as it requires less time to manage. This entry was posted in adwords, article, Google, marketing, reviews, software, tools and tagged adwords, conversion optimizer, cpa, cpc, experiment, Google, results, test on 7 July 2009 by Andy Brice. Thanks for sharing the results. I’d been thinking about CPA every now and then, and may still again, but until then I’ll stick with what seems to work with a minimum of fuss and bother. Pingback: CPA and Tracking Your Marketing Efforts. | Zero Friction Marketing Review and Bonus. I’ve been using Google Adwords for two months, and have only tested with CPC since that is what others told me to start with. Maybe once my campaign starts showing positive results over a period of time, I will start looking at CPA as a means to manage the campaign smartly. Great article and thanks for sharing the results. I think CPA has improved over the last couple of months. 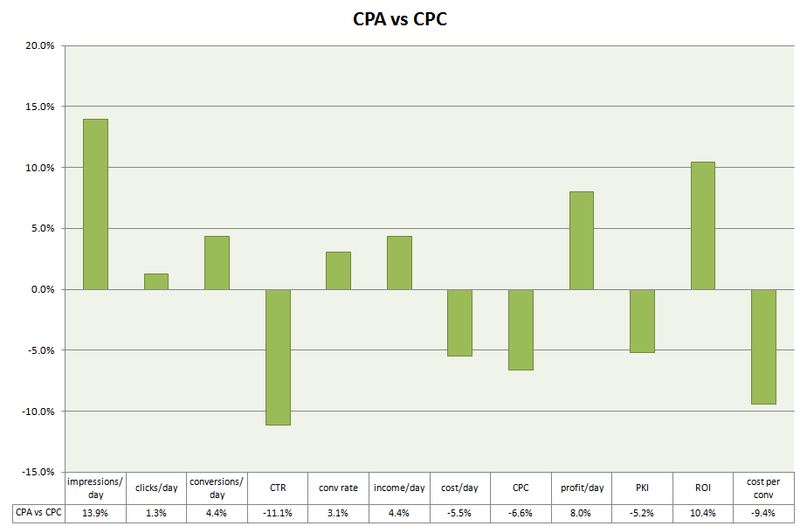 Thanks for sharing your data about the efficiency of CPC vs CPA within Google adwords. Unfortunately we can’t really reach a statistically significant conclusion here because you didn’t ran each campaign simultaneously (this is a bias in your experimental design due to potential variations in time, numerous seasonal effects etc). Furthermore i think it would make sense to know how many conversions you measured as a difference of 6.6% between CPC and CPA requires a good confidence interval in order to be really accurate. Don’t get me wrong here, your article is great, i just wanted to share with you my feedback because i know that sometimes reaching conclusions too fast may result in significant losses. As I say in the post “It wouldn’t be wise to draw any sweeping conclusions from one test with a limited amount of data.”. So I am not claiming it is a rigorous, statically valid result. Even if it was, it might not be applicable to other products. The number of conversions used is commercially sensitive. I’d like to post your article on my website http://www.CPABenefits.com and would like permission to do so. This mirrors my sentiment 100%. I don’t know how Google can pitch CPA as a viable option. I think it is for suckers. I am going to point to this article in my book. http://ppc-optimization-secrets.com. Please let me know if this is an issue. That is fine, as long as you include an appropriate credit. Please note however that I am testing CPA again and may switch to CPA full time, simply because it requires less time to manage. Thanks for doing an in-depth analysis. I wonder if the algorithm has been improved over the past 18 months? Now that Google is eliminating Position Preference (http://adwords.blogspot.com/2011/04/adwords-position-preference-feature-is.html) I’m forced to weigh my alternatives to a wonderful feature that had significantly lowered both my cost per click AND cost per conversion.